Sometime before the campaigns of Llywelyn the Last, during a more peaceful time and settled period on the borders, a new church was built in Aberedw. It occupies a commanding position on the rising ground further up the valley of the Edw from the castle and the Mound, and is undoubtedly on the site of a much earlier place of worship which may well date from pre-Christian days. At the end of the 19th century 200 skeletons were discovered on the north-east side of the church, but these apparently date from the Middle Ages. Perhaps they are associated with the shield boss made of bronze which was found near Llywelyn’s cave in 1874, dating from the 15th century. The visitor cannot avoid noticing the ancient yew trees on the north side which are judged to be at least 1500 years old. Dating from this time they may have been in place when St Cewydd was living in his hermitage, reputedly in what is now known as Llywelyn’s cave on the hill over the river. An inscription inside the church tells what little is known of St Cewydd, a local saint, whose only other dedications are found at Cusop on the Hereford border, and Disserth to which tradition has it that he habitually walked by way of Maengewydd (Cewydd’s Rock) on Aberedw Hill. He is still recognized in Wales as the patron saint of rain and, as such, may be deemed as having more formidable influence than the English St Swithin! There is no documentary evidence available to determine the exact date of the present church, although it is referred to in the Taxacio of 1291. Unlike English churches architectural styles in Wales offer few clues as the little churches were nearly always built by local craftsman, and did not always conform to the fashionable patterns of the age. 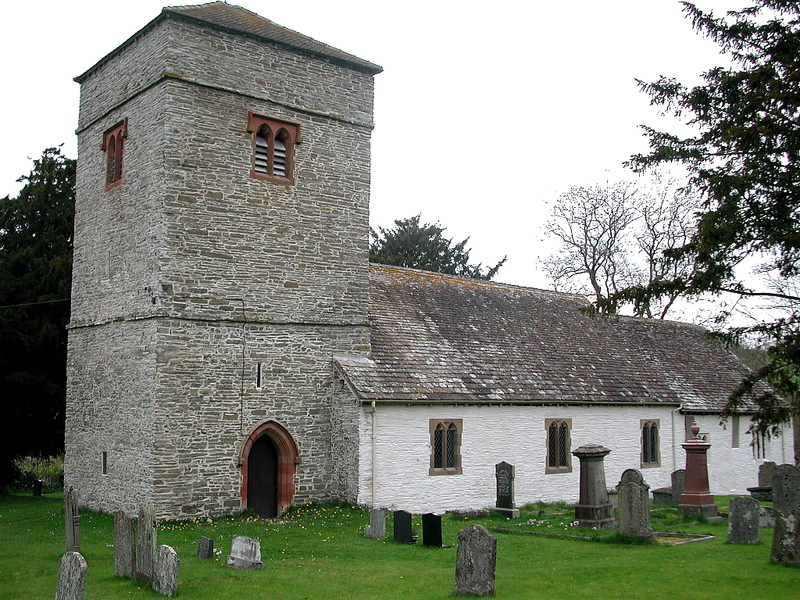 The church tower is plain and sturdy and of pleasing proportions. It is built in three stages, divided by two rough string courses. The middle stage is battered and the upper course slightly overhangs and the whole is topped by a low pyramidal roof. Llywelyn ap Gruffydd’s association with Aberedw is well documented in history and legend, although controversial and conflicting accounts of his betrayal and death still abound. What is beyond dispute is that King Edward gained great personal satisfaction from the death of the prince whom he regarded as the greatest obstacle to his ambitions in Wales, and had Llywelyn’s head displayed from the battlements of the Tower of London. Legend has it that the custodian of nearby Builth Wells Castle, Giffard, had refused to support Llywelyn shortly before the prince was killed. After his death, Giffard’s wife, who was a relation of the prince pleaded with the Archbishop to permit a Christian burial, supported by Edmund Mortimer on the grounds that he had heard Llywelyn calling for a priest as he lay dying and that he had attended Mass in Aberedw Church on the morning of his death, Friday 11th December 1282. This is also a local cherished belief.